Synopsis: Hellboy is back, and he's on fire. From the pages of Mike Mignola's seminal work, this action packed story sees the legendary half-demon superhero (David Harbour, "Stranger Things") called to England to battle a trio of rampaging giants. There he discovers The Blood Queen, Nimue (Milla Jovovich, Resident Evil series), a resurrected ancient sorceress thirsting to avenge a past betrayal. Suddenly caught in a clash between the supernatural and the human, Hellboy is now hell-bent on stopping Nimue without triggering the end of the world. The script is a true collaborationbetween Mignola and Andrew Cosby. Mignola remained involved in the process throughout, reading each successive draft to ensure the screenwriter stayed true to the character. 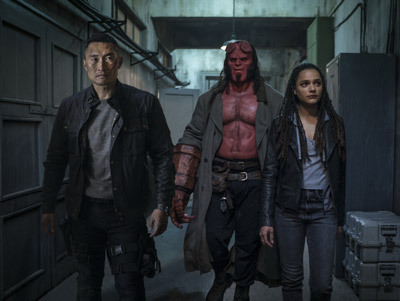 "It was important for us, and for the fans as well, to really stick to the roots and origins of Hellboy," says producer Les Weldon. "No one wants somebody else's Hellboy " they want Mike's. It felt almost like we were doing a biographical or historical movie. Source material is key. We had Mike, and I think it really, really paid off." 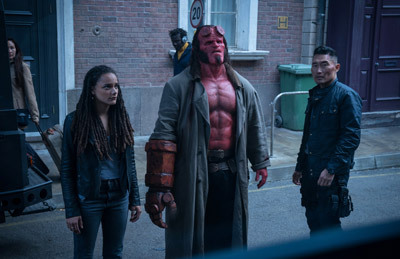 "We wanted a director who could handle both horror and action, and also be strong with character " in particular, that dry, near-gallows humor that often comes out of Hellboy," says Levin. "Our intent was to set this film squarely in our world, rather than have it be fantasy with a capital 'F.' Neil's work very much reflected that." The director says he felt the weight of responsibility to the franchise's fans as well as to Mignola and the producers to get it right. "Larry and Lloyd had carried the torch for this for quite some time. So, the question was what could we do that would reinvent it some way that isn't radically deviating from the source material " and in some ways would be more faithful to the source material? I saw a lot of potential in a darker version. And Mike and everyone else connected with that concept as well, so it was like, 'Okay, let's go dark with it.'" "I was like, oh, that's very flattering… and horrifying that you guys would think that I would be this angry demon!" laughs Harbour. "But it seemed to fit. It was a lot darker, a lot scarier than comic-book movies are in general." 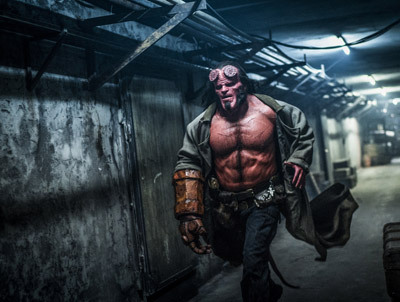 Casting Harbour turned out to be a pivotal creative decision, says Levin, because the actor perfectly captured the version of Hellboy the filmmakers were going for " and then took it to the next level. "Throughout the development process, we tried to make Hellboy more accessible, more grounded, more emotional and empathetic, along with his trademark, deadpan sense of humor," says Levin. "But I never fully realized what that meant until David stepped into the role. Those ideas flourished well beyond what we initially imagined because he internalizes story and character so deeply." The Ukrainian-born actress, perhaps best known as the star of the hugely successful Resident Evil franchise, says she was immediately intrigued by her character's plight. "What got me right away was that I thought she was right-on with what she stands for " and she's immediately challenged and betrayed. Her points are valid, but she's defeated. So I was fascinated and I wanted to know where her story was going." Nimue exploits that connection " and Hellboy's own doubts and insecurities " to try to seduce him into joining her, says Jovovich. "She says to him, 'You're one of us.' She wants to know why he's trying to live like a human, to get these people who hate and fear him to accept him. She tells him, 'You could be a hero in my world.' She wants his strength added to her kingdom, to make it their kingdom." Harbour appreciated Jovovich's professionalism as well as her solid grasp of the fantasy realm. "I really enjoyed working with Milla," he says. "She understands every aspect of this art form and how to get the best out of the work. It goes beyond just acting " she's always thinking about the broader picture. And she's sweet and kind. She just let me stay in my intense, weird place, always sensitive to it. It was wonderful." 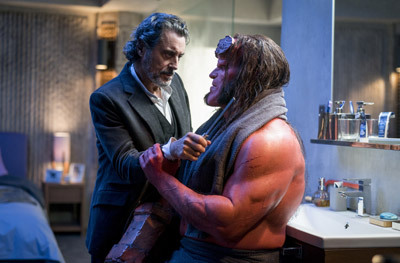 In casting Hellboy's adoptive father, the erudite and somewhat prickly Professor Trevor "Broom" Bruttenholm, the filmmakers turned to acclaimed British actor Ian McShane. Perhaps best known in the U.S. for his Golden Globe®-winning role as boomtown saloon owner Al Swearengen in the HBO series "Deadwood," McShane has appeared in hundreds of films and televisions episodes in a career that spans more than five decades. McShane enjoyed the complexity and depth of the script's depiction of Hellboy's close but complex relationship with his dad. "It's sort of them against the world," says the actor. "It's been rough and tumble between them. Hellboy didn't grow up playing Monopoly with his father " it was more that he taught him how to fight a five-eyed monster and take him out with a melon baller." Broom has tried to prepare his son for the inevitable day when he will be on his own, says McShane. "He has protected him, but when he goes, Hellboy will have to be a fully realized human being " to take on the human world, as well as the human-monster world." The actor says he enjoyed the fantastical elements of a film where humans and demons co-exist. "Playing opposite a six-foot-seven man who's red with horns is actually kind of fun, because David's a good actor, who just happens to be a guy who's six-foot-seven with red horns. You know, it's perfectly fine and perfectly reasonable." Kim was cast just days before shooting began and arrived on set in Bulgaria after a 30-hour journey, just before his first scene. "It was all really quick," he says. "That was a challenge, but also invigorating. David and I are both theater actors from New York, so he has a natural generosity and curiosity that I identify with. Things felt very organic, which is often not the case in situations like this." 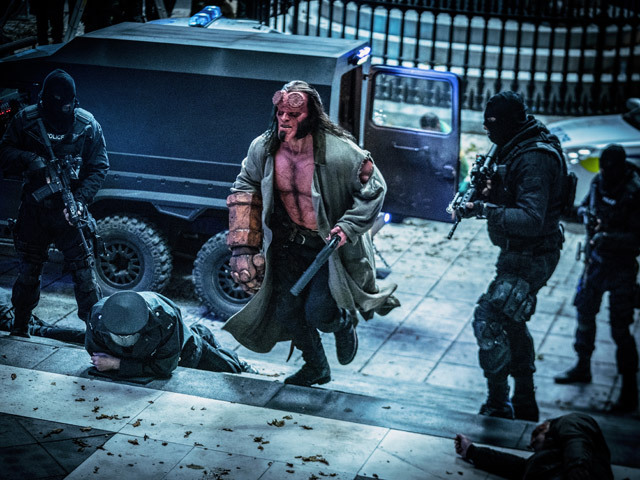 The actor describes the dynamic between Daimio and Hellboy as "sticky." "They are teammates, but they don't always share the same perspective," he explains. "So, it takes a little while for the two of them to come to a working relationship." "Sasha's audition readings were incredibly compelling," says Levin. "She had such great attitude, heart, individuality and accessibility. We wanted Alice to be more of her own character, to have a strong voice. Sasha really elevated the role " we were lucky to be able to cast her." Hellboy's connection with Alice is integral to the story, notes the actress. "It's not romantic, but it's definitely kind of a soul-mate thing. Because of who they are, and how they feel different from everyone else, they might feel the pull to just take the easy route " the dark one " but together they keep trying to fight the hard fight rather than just give in." When it came to designing the look of the film, Mignola's comic books provided the filmmakers with an illustrated guide to the Hellboy universe. "Mike's an incredible world builder," says Levin. "It's a tremendous opportunity to transfer his vision to the screen. So all the way through we referenced what was in the books. There are other influences as well, but we mined much of the look from the comic books." 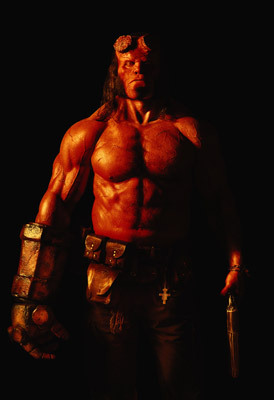 To accomplish Harbour's transformation into Hellboy, the filmmakers enlisted Oscar®- and Emmy- winning special character makeup designer Joel Harlow. During pre-production, he worked with a team of four veteran designers to create every inch of the character, from the sawed-off tops of his horns to the tip of his tail, using Mignola's drawings as the primary reference. "The structure of Hellboy's face was always about Mike's illustrations," says Harlow. "The jaw and the brow and the hardline aesthetic, that was our jumping off point. But, in taking the design into reality, we wanted to move from a comic world to a real world. The result is probably scarier, because he's no longer a fire-engine-red cartoon character. He has hair on his chest and arms, back and tail, and scars " he was described to me as having the body of an MMA fighter. We wanted his Right Hand of Doom to be different from any version seen before. And we get to see Hellboy's hooves in this film. For every aspect of the character design, Mike provided direction the entire time." With the head in place, another assistant was charged with getting Harbour into the bodysuit. Six were created and rotated, allowing for re-hairing and small repairs " with at least one camera-ready at all times. "It was the weirdest part of the process," says Harbour. "My arms were covered in K-Y Jelly, and I was slided into this complete suit that zipped up the back." After that, the creature's Right Hand of Doom and tail were attached. The pieces' edges were blended, and hair " mutton chops, soul patch and wig " were added. The signature horns were glued on, with a little blood added. Finally, a contact lens tech put drops into Harbour's eyes " a process repeated every 20 minutes the lenses remained in, up to the limit of four hours " to prevent corneal abrasions, and the yellowish-orange contacts inserted. From start to finish the application process took about two hours, with another half-hour at the end of the day to remove everything except the dyed left hand, which stayed red for the whole shoot. That saved Harlow and his team from having to re-dye the hand on each of the more than 60 days of production. "I just ended up walking around with a red hand," laughs Harbour. "Looking like, I don't know, David Bowie, or someone who'd been in an accident." Marshall says he rarely saw Harbour without his makeup during the shoot. "I saw Hellboy walk onto set, and he was living and breathing that character until he left at the end of the day," says the director. "On the rare occasion when I would see David without makeup, I'd think I hadn't seen him in ages. But then I'd remember, 'Oh, yeah, you were on set all day.' He became this character, and that's who he was every time he walked onto set." Never sure who or what he's going to encounter, Hellboy tries to be prepared for anything. But sometimes things don't go as planned and he simply has to improvise, says Harbour. "I talked a lot with Mike about what all the things in this belt he wears are. Mike said that, as a paranormal detective, he's going to have to fight all kinds of creatures " vampires, witches. So, he carries stuff like garlic and silver bullets. But in a way, he really doesn't know what he's doing. He might throw a bunch of garlic on somebody and then realize, 'Well, that didn't work.' But he shows up and goes in, pretty much figuring he'll just have to knock somebody out. He just goes for what works at that moment." The Hellboy production required the services of roughly 1,200 cast and crew members. Three units shot on location in the United Kingdom and Bulgaria, and on more than 20 sets at Nu Boyana Studios in the Bulgarian capital, Sofia. The massive, state-of-the-art studio features multiple backlots, which stand in for locales including Mexico and the U.K. in the film, as well as 10 fully equipped sound stages. Production designer Paul Kirby and director of photography Lorenzo Senatore worked with Marshall to devise a color palette based on the Hellboy comics. "The original material Mike Mignola produced has a brilliant palette," says Kirby. "When you see Hellboy, he's the only red in the frame. When he's not in frame, something else is red " a fire, the Blood Queen's costume. All of the rest of the colors are these muted tertiary colors. That was something we really strove to do in the design." Weldon offers enthusiastic praise for the stunning visuals created by Marshall, Kirby and Senatore with the invaluable help of hundreds of local production pros. "We had one of the best crews in the world on this film," says the producer. "We had amazing technicians and artists in Bulgaria, who were able to realize this intricate world of imagination. There are layers upon layers visually and artistically. I remember watching one scene on the monitor, in King Arthur's tomb. On the screen it looked like a complete frame from the comic book had come to life. The collaboration and the results have been astounding." Naturally the first conversations between Marshall and costume designer Stephanie Collie during pre-production centered on finding the ideal wardrobe for the film's central character. "Neil really liked something I included in my reference " the idea that Hellboy's coat echoed old-Hollywood gunslingers," remembers Collie. "I imagined Hellboy whipping around in a duster coat and the fabric flowing with him. David is a big guy, and in the suit, even bigger. It was a challenge to make something that would fit on that shape, so there were a lot of fittings to get the right silhouette." Collie was inspired by the fact that the film's action takes place across several time periods, including the 6th century, the 1940s and the present day. "What we designers thrive on is trying to convey a number of things " character, period, story " in a garment," she says. "The thing that strikes me about the comics is that they're slightly timeless. A really realistic depiction of modern dress would date quickly." As she worked to create the Nimue costume, Collie flew to Los Angeles to meet with Jovovich. "We tried different things to capture the character's essence, something that could change with her evolution, her mood and where she was on her journey," Collie explains. "In a way, she's an innocent when she first appears in the film " it's circumstance and others' betrayal that turns her into what she becomes. The dress is very simple, actually, created with meters and meters of silk dyed in an ombre effect, with dark at the hem fading out to almost flesh color at the top. The effect is near invisibility, which is what we wanted. "Milla is also in this beautiful wig, and that " along with these shoes that you can't really see " gives the impression of floating. With the wind machines and her movement, it looks like she's levitating. We decided to keep her in that costume her entire journey." Jovovich says she was thrilled with her character's entire look. "I love the costume that Stephanie developed. An amazing makeup artist Paul Pattison came up with the makeup and hair design. The long wig really kind of drives Nimue's look, and Paul and I agreed she needed to have a really ghostly, ethereal, kind of shiny appearance, so they basically spray me silver. When I come back, it's been 1,500 years, so I'm kind of this undead, decayed monstrosity. I call that the dumpster look " like something moldy you'd find in the garbage. But as I gain my power, my beauty starts to come back." According to Collie, it's usually the first costume an actor tries on that wins the day. But customarily other outfits are tried " and discarded " to reinforce the decision. "For Daniel's character, I found a great pair of grey boots, and layered jeans, a shirt and a waterproof jacket. He tried them on and said, immediately, 'Yes, this is it.' Pretty much the same thing happened with Ian's 1940s costume. He put the first look on and said, 'This is it, darling, we've got it.' With Daniel, we did try on other things, but with Ian, when other outfits were offered, he said, 'We don't need to. It's all fine.' So, I just had one picture to show for that look, and luckily everyone agreed!" For Professor Broom's modern-day outfit, McShane asked his favorite Soho tailor to create a threepiece corduroy suit. "It's just fantastic," says Collie. "As a man born in the 1900s who stops aging in the 1940s, there's no reason he would suddenly become modern. He'd stick with a suit that has the shape and feel of the '40s. We used a variety of different collarless shirts to go with it." After an array of 3D concept models were developed for Hellboy's hand cannon, the filmmakers picked one designed around a 140-year-old Austrian revolver, from which the armorer then created a fully functional steel version. The resulting weapon weighed about six pounds and fired actual .38 caliber blanks. Daimio's firearm is a super-sized version of a 150-year-old Colt Derringer. Hellboy's belt " which holds things an otherworldly entity might find deadly, including a rosary " was adapted from multiple concept designs. Buchmann also oversaw the creation of the Osiris Club's gianthunting backpacks, portable generators that send large jolts of electricity through attached lances into the bodies of their enormous prey. The Excalibur sword is a nearly exact replica of the one Mignola drew, according to Buchmann. "There are a few tweaks, but it's basically right out of the comic books."